The Bega Valley Shire Council Social Issues papers were developed to identify key social issues affecting our community. They were developed by staff through consultation with the community, online feedback, meeting with service providers, research and through evaluating previous social plans. 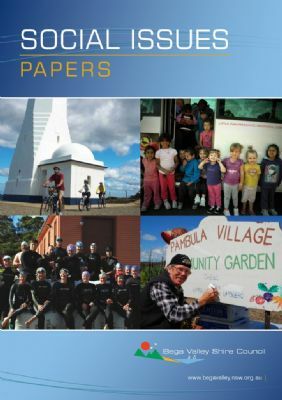 The papers are not designed to be an in-depth study of each issue or target group, it is an overview of those issues that will highlight particular areas of concern or need in the Bega Valley. These papers will be used to identify opportunities to respond to community needs, advocate for additional services, develop partnerships and get a better understanding of the social issues that affect people living in the Bega Valley - in particular the disadvantaged groups. The Social Issues papers are available as one large document or as individual chapters depending on the community's interest. The papers will also be reviewed as new statistics are released. Bega Valley Shire subscribes to a series of demographic information resources designed to inform community groups, investors, business, students and the general public about the characteristics of Bega Valley's population and how they are changing.